According to the world statistics, every year more than 50 million people suffer injuries of varying severity only as a result of traffic accidents. Such a large scale of the problem shows that there is a need to introduce modern solutions in the treatment of traumatic injuries to raise the survival level. Today, traumatism is one of the major causes of mortality of the working-age population. Each year millions of people suffer injuries of varying severity (domestic, street, as a result of traffic accidents, etc.). According to the world statistics, every year more than 50 million people suffer injuries of varying severity only as a result of traffic accidents (Medelets N.A., 2012). As for Ukraine, for the period from 2006 to 2013 about 378 thousand people were injured on the roads (Lando Ye.A., 2013). 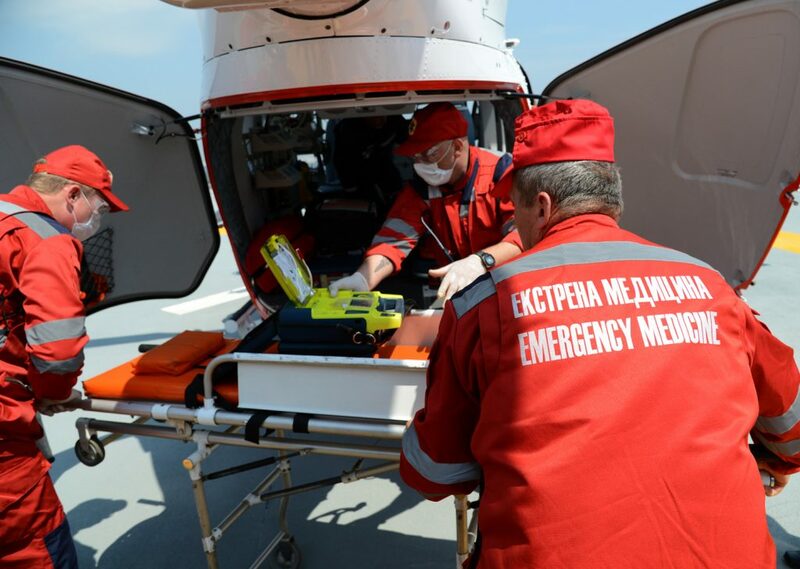 Such a large scale of the problem shows that there is a need to introduce modern solutions in the treatment of traumatic injuries to raise the level of medical care, especially with regard to emergency medicine when time and level of medical care play a key role in case of the acute blood loss of traumatic genesis. Bleeding is one of the most severe complications of various diseases and injuries. This is a commonly faced problem for surgeons, traumatologists, orthopaedists, urologists, obstetricians, anaesthetists and emergency doctors. Bleedings often pose a direct threat to the patient’s life and almost always require immediate actions. And person’s fate often depends on the skilfulness of these actions. In peacetime, tissue injury remains a common type of injury which can occur at home and at work, and the percentage of patients with traumatic pathology is about 35-45% in the general structure of surgical patients (Mironov V.I., Gileva I.I., 2009 ). biocompatibility and rapid regeneration of the damaged tissues. However, not all materials used for haemostatic products meet these requirements. Preference should be given to the chitosan-based products (Boyarintsev V.V. et al., 2015). In this context, completion of the certification of a new haemostatic dressing that meets modern requirements is good news for specialists who deal with bleeding in their daily practice. Haemostatic dressing REVUL®, which expanded the range of haemostatic products REVUL® by pharmaceutical corporation Yuria-Pharm, obtained certification in February 2017. HOW TO USE HAEMOSTATIC DRESSING REVUL®? Take the package with haemostatic dressing REVUL®, check the integrity of the packaging, open the package and take the material out of the packaging. Perform a tight tamponade of the wound, preferably to the source of bleeding. Leave haemostatic material in the cavity of the wound. You may cut or tear off the remaining material if necessary. DO NOT THROW EMPTY PACKAGE AWAY! Firmly press the gauze swab to the wound for 5 minutes. Seek medical assistance in the nearest first aid station as soon as possible. Give empty package to medical workers. Medical product REVUL® may be in the wound of the injured person during 24 hours. The clot formed by it does not dissolve and does not change its properties. Chitosan breaks down into polysaccharides and is naturally excreted from the wound in 24 hours. Haemostatic dressing REVUL® is a modern solution for effective bleeding control. It can satisfy the demand for a high-level medical care in the peacetime emergency medicine. Haemostatic dressing REVUL® shows haemostatic effect regardless of the blood clotting processes in the body. Haemostatic effect is caused by binding of positively charged elements of material with negatively charged erythrocytes. When contacting with blood, haemostatic dressing REVUL® enhances the absorption of blood liquid fraction and forms a single gel-tremellose mass which results in reduction of bleeding. It can be used to control external bleeding of varying intensity, including when large venous and arterial vessels are damaged, mainly at pre-hospital stage. Haemostatic dressing REVUL® has Z-shape folding to facilitate its application. The composition of its material is of a particular interest. It is made of chitosan, natural substance having a number of useful properties. Haemostatic dressing REVUL® is designed to meet modern requirements regarding the need for haemostatic products in emergency medicine. Chitosan is a cationic polysaccharide having high sorption properties. Large-scale studies of haemostatic effects of chitin and chitosan began over 30 years ago. The mechanism of the chitosan’s haemostatic effect is associated with the ability of its positively charged molecules to combine with negatively charged membranes of blood cells, causing their adhesion and activation of plasma haemostasis (Belozerskaya G.G. et al., 2006). We also know that chitosan shows antimicrobial activity, facilitates tissue regeneration, activates healing of the surface of a wound or a burn without scarring, and it is hypoallergenic. There is data confirming that chitosan also has antioxidant, immunocorrecting and antiviral properties (Zhanzakov A.E., 2007). In addition, macromolecules of chitosan are characterized by high adsorption capacity and biological compatibility and can be successfully used as matrices, i.e. carriers of nutrients, medicinal agents, metals in ionic form and their nanoparticles (Apryatina K.V. et al., 2014). Due to the above properties, haemostatic products based on chitosan are one of latest means for bleeding control, both in peacetime and during hostilities, which demonstrates the relevance of equipping emergency medical teams and military first aid kits with haemostatic products based on chitosan for the needs of those who defend our country in the east. Control of bleeding caused by traumatic lesions became particularly relevant due to growing number of anthropogenic and natural disasters, terrorist attacks and military conflicts. For Ukraine this subject is also painful because of the military conflict in the east which determined additional challenges for the national health care system, including the need to promptly solve fundamentally new problems. For example, since Soviet military first aid kits became “morally” outdated, the Ministry of Health of Ukraine, by the Order No.6 dated 5 January 2017, approved new lists of medical products and devices which must comprise the all-arms individual first aid kit, all-arms car first aid kit; all-armsshoulder medical kit of an orderly man, and all-arms shoulder medical kit of a combat medic. New first aid kits consist of medical products, dressings, suture materials, adhesive plasters, medical items, surgical instruments, medical and utility items, and the accompanying documents. When drafting this document, the Ministry of Health Ukraine took into account the standards of NATO (North Atlantic Treaty Organization) and combat experience in the ATO area. It is a known fact that NATO’s first aid kit is based on the best achievements of tactical medicine. The content of these first aid kits is regularly revised and supplemented with modern and effective products and medicines. In this context, it should be noted that haemostatic dressing REVUL® meets modern requirements to all-arms individual first aid kits, all-arms car first aid kits, and first aid kits of a combat medic. Thus, haemostatic dressing REVUL® has been developed to meet modern requirements with regard to the need for haemostatic products in peacetime and in time of war, as when it comes to bleeding control, especially a massive one, the use of haemostatic product should not only effectively control the bleeding, but also reduce the risk of negative effects for injured people. Haemostatic dressing REVUL® is a modern solution for the needs of the country!